The color of the walls was chosen and applied by Leo, Eva’s son, when this was his room. I thought it too bold but, by the time he moved away to university, I had grown to like it. In any case, I don’t paint walls unless under duress. The large and cluttered cork board which filled most of the wall to the right of the Eastern Orthodox icon and the portrait of August Strindberg, is now behind me as I sit at my writing desk. I can now visualize a gallery of impressions and memories these six objects evoke. I was one week short of nine years old when Mom, my younger sister Diane, and I arrived in New York City’s Grand Central Station on New Year’s Day, 1946, after a five-day train trip from San Francisco. We reunited with Dad who had already begun working for his cousin George in Manhattan. He had rented a flat for us on the third, top floor of a tenement near the Brooklyn docks from which he could commute to work by subway. It was a rough neighborhood and a continuous hell for me, but Diane and I learned to navigate and survive in it. We spent weekends mostly at home when Dad was off from work. The weekends were when Dad closely monitored my piano practice, and when we all listened to WQXR, the classical music station. Dad and I played a game, a challenge to identify the composer of a piece playing on the radio. I had a difficult time differentiating among the symphonies of composers from the classical and romantic periods: Mozart, Beethoven, Schubert, Schumann, Mendelssohn, Berlioz, Bizet, Dvořák, Saint-Saëns. But I could always identify Paganini. We often heard his violin concertos—numbers one and two were the most often presented. My challenge then was to guess the number. These times with music and my father were in a universe apart from the dirty and dangerous streets below our flat, but not a heaven. Dad was often mad in those days. 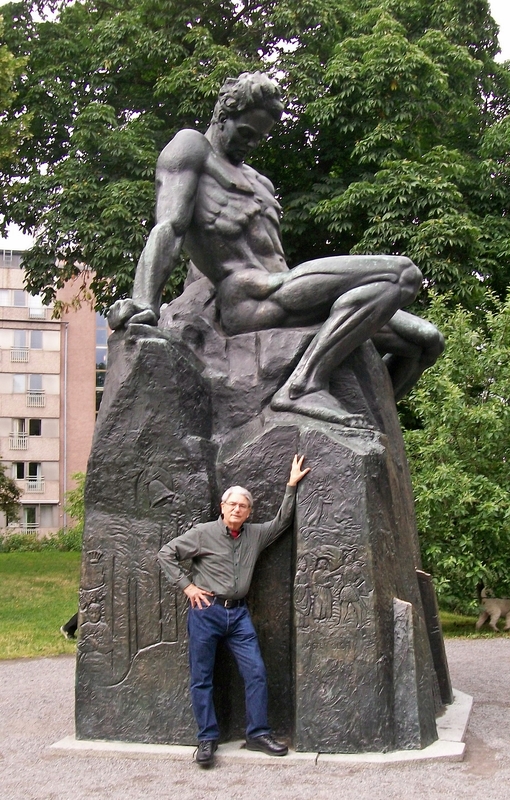 Fifty years later I moved from California to Stockholm, Sweden to live with Eva. She has a framed portrait of Paganini, a sketch drawn with a fine-pointed instrument. The portrait was a gift from one musician to another, the recipient being Eva’s maternal grandfather, Heinrich Rottman. Heinrich played cello and formed chamber groups as he traveled Europe. He was sometimes a mentor to his fellow musicians. He met Regina Andersson while performing in Stockholm and decided to stay a while. They married and he eventually became a Swedish citizen which, a few years later, enabled him to avoid being drafted into the German army at the beginning of World War One. 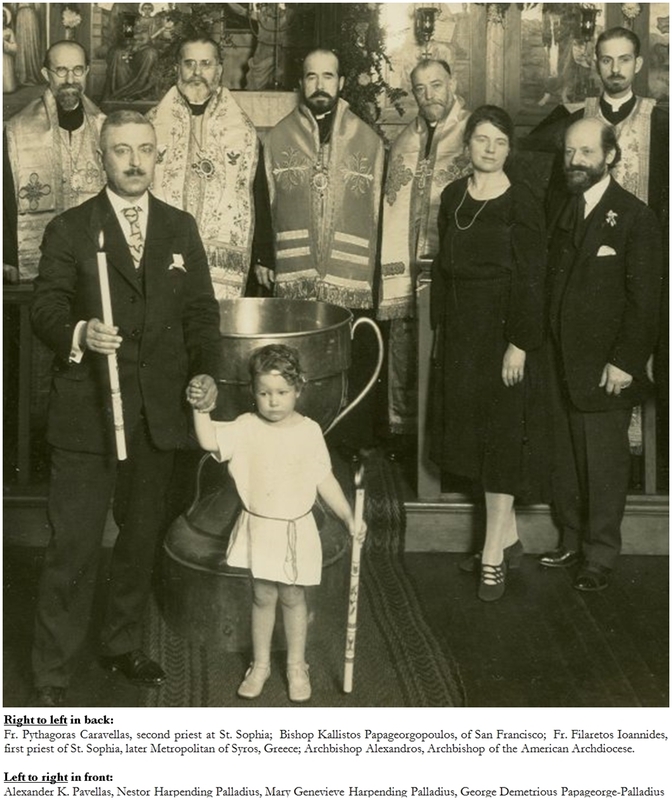 Dad’s father, Alexander K. Pavellas, was a major supporter of the Greek Orthodox Church, St. Sophia, in San Francisco. He was godfather to many children, including my mother—but there was no further connection between the two families until Dad and Mom met seventeen years later. This picture was one of a few Dad left behind. Before his death, which was gradual but certain, he destroyed many books, documents, and pictures. His memories and dreams haunted him throughout his life. I came across the picture in Stockholm as I began organizing my genealogical documents. I contacted the Greek Church in San Francisco to see if they had an interest in the picture. Jim Lucas, President of the San Francisco Greek Historical Society, was joyful upon seeing the image I had sent by email. 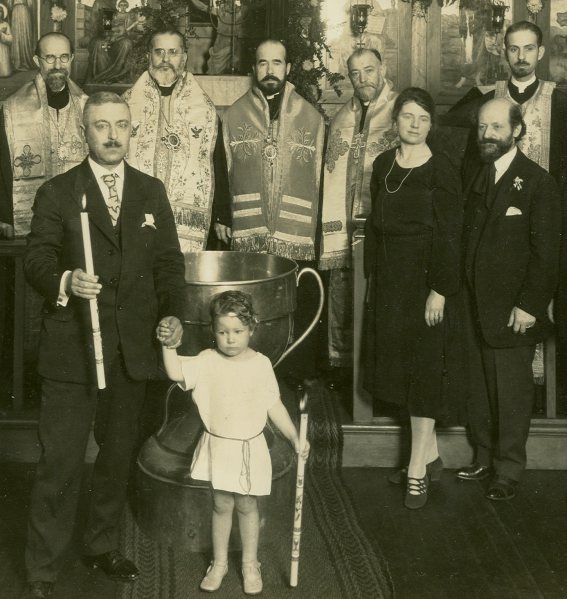 The picture was unique in that it included all the priests at the beginning of St. Sophia’s. He invited me to be interviewed as part of their historical research. When I next traveled to California, I gave him the original picture and recounted for the record everything I remembered about Alexander and George who were partners in business and other enterprises. A few months later in Stockholm, I received from the Society a reproduction of the 15th-century icon of the three angels who appeared to Abraham at the Oak of Mamre. The site of the oak was acquired in 1868 by Archimandrite Antonin (Kapustin) for the Church of Russia, and the Monastery of the Holy Trinity was founded nearby. 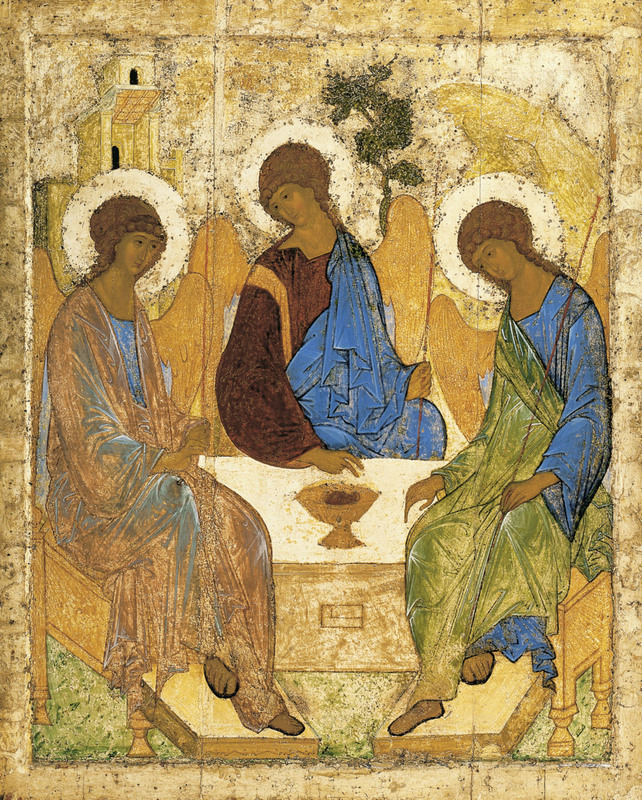 The icon has since been known as “The Holy Trinity”. 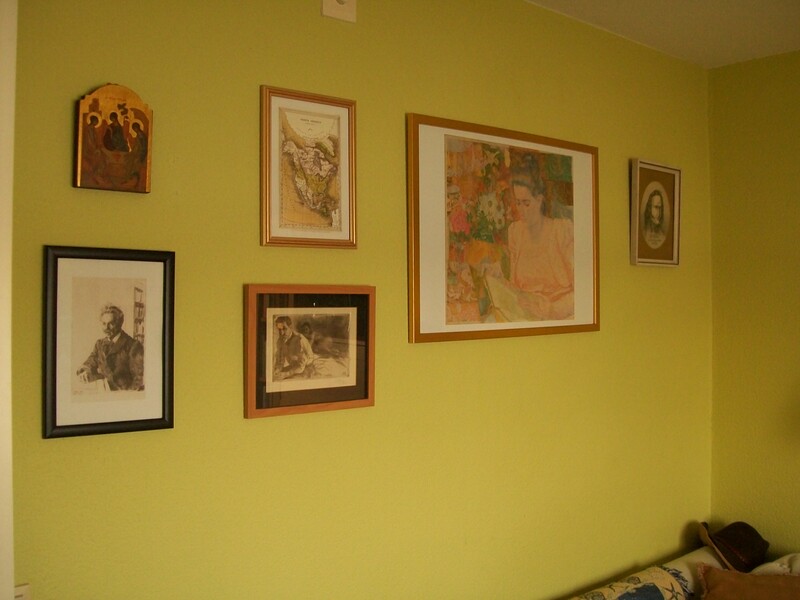 Another family heirloom I encountered upon moving in with Eva was this etching by the Swedish artist Anders Zorn. It had been a gift, or payment in kind, to her physician father. It was on the wall of her, now our, bedroom, which seem the appropriate place. We did not then know the identities of the subjects in the picture, and I was not yet aware of Zorn. Later, as I visited museum and galleries in Stockholm, I became aware of what a great artist Zorn was, and how much I like his representations of females. I dubbed him the Swedish Renoir, the latter being a favorite artist when I discovered the impressionist movement in my twenties. I share the appreciation of the feminine which these men have, but they have the artistic gift to go further. One gallery lately advertised a showing of Zorn’s work which I, of course, visited. 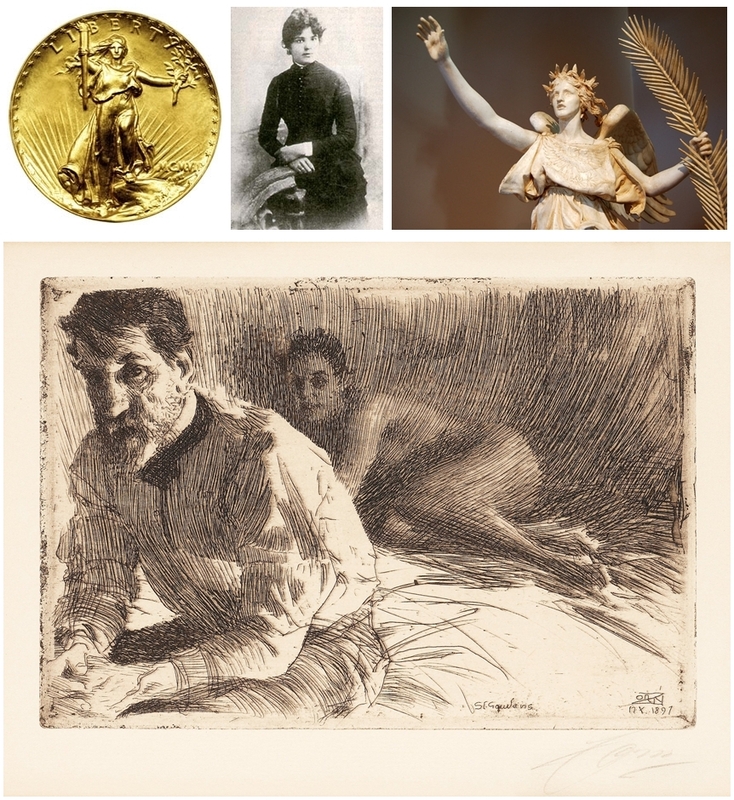 What I found in addition to more studies of the female in nature and in the bath, were the many portrait-etchings Zorn made of friends and patrons. They reminded me of the one at home and I searched the gallery to see if I could find a print of it. I didn’t. Back home I told Eva of my experience and she said, yes, it was Zorn’s etching she had. See, there’s the signature. Her father was told it was an original print and therefore valuable, but she recently was learned it was a copy. Years later, upon our moving our bed to another room, the picture moved to the closet. I see the small rectangle of paper with the image created by Zorn as now imbued with gravitas. My wall has grown greater. October 18 in Sitka, Alaska, is the date and place of the annual “Changing of the Flags”. A Russian flag is lowered and a US flag is raised in a re-enactment of the transfer of Alaska from Russia to the USA in 1867. It is a solemn ceremony, with men dressed in authentic Russian and American military clothing, carrying arms of the period. I happened to be there for the ceremony in 1979. In September 1979, I changed my job as chief executive of a hospital in Modesto, California to a similar position in Anchorage, Alaska. The Anchorage hospital was a member of the Alaska State Hospital Association which rotated its annual meetings among the Alaska cities where member hospital are located. In 1979, it was Sitka’s turn, so I traveled there to represent my hospital. 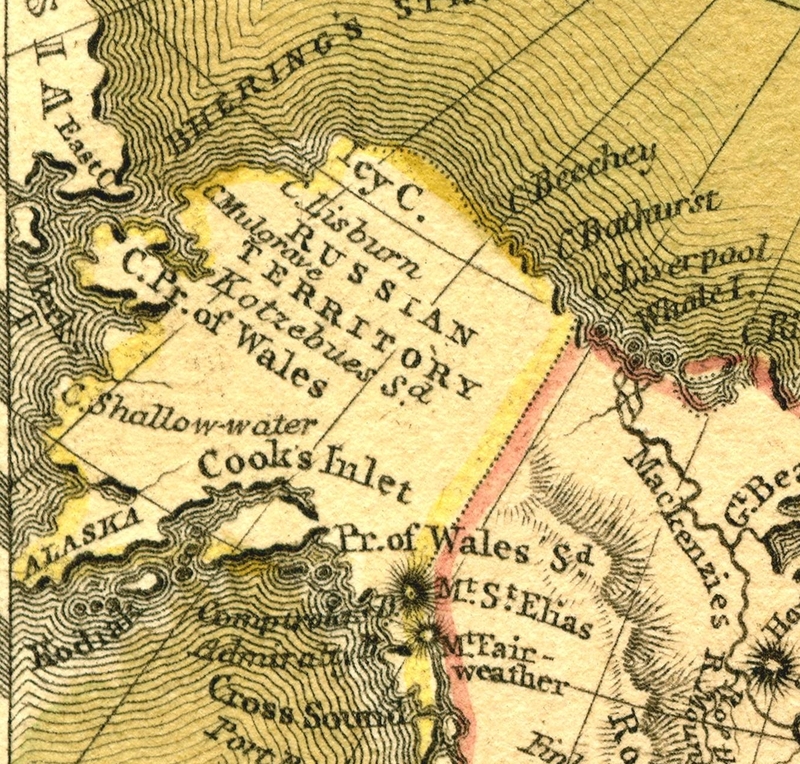 Miniature map of North America, Bull, London, March 1st, 1831. Hand-colored Price $36.00. These tiny maps, of much modern charm, were originally sold as salesmen’s samples. This is a particularly fine example. Best seen under magnification. Warranted authentic. October twenty-fifth, 1979. Dee Longenbaugh. 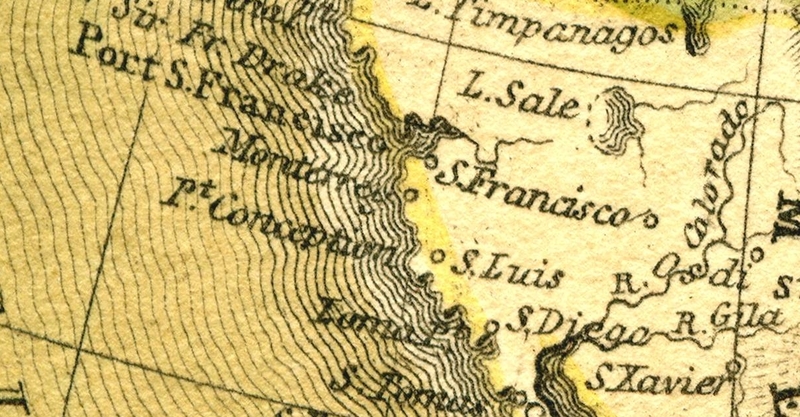 The area of the map image is three inches by five inches. As one’s eyes become older, the fine detail of the map becomes more difficult to discern without the ‘magnification’ Dee Longenbaugh recommends. So, the little map traveled with me, hidden in my files until I unearthed it in Stockholm thirty-five years later. In 1979 I didn’t have a personal computer, nor a flatbed digital scanner, nor an inkjet printer. Now I do. So I scanned the map at high resolution to create a six-megabyte digital file and printed it at four times its original size (to six by ten inches). This is large enough to frame and hang on the wall for appreciation from across the opposite side of an ordinary-sized room in a flat. And so it was, just over my right shoulder as I sat at my desk. But now, the blank wall gave me the opportunity to view it more directly. When gazing at the map, as now I often do, I’m reminded of having lived in Alaska for eight winters, and in California for many summers. Perceiving the vast distances between and within these two places reminds me of my extensive travels and the memories they collected. Two of my children were born in Alaska, and now another lives there with his wife. Click here for a record of Eva’s and my visit there in 2010. Dee Longenbough is still in business. You can connect with her here on Facebook. August Strindberg was a Swedish playwright, novelist, poet, essayist, and painter. He and Anders Zorn were contemporaries, their lives overlapping for fifty-two of their respective years. 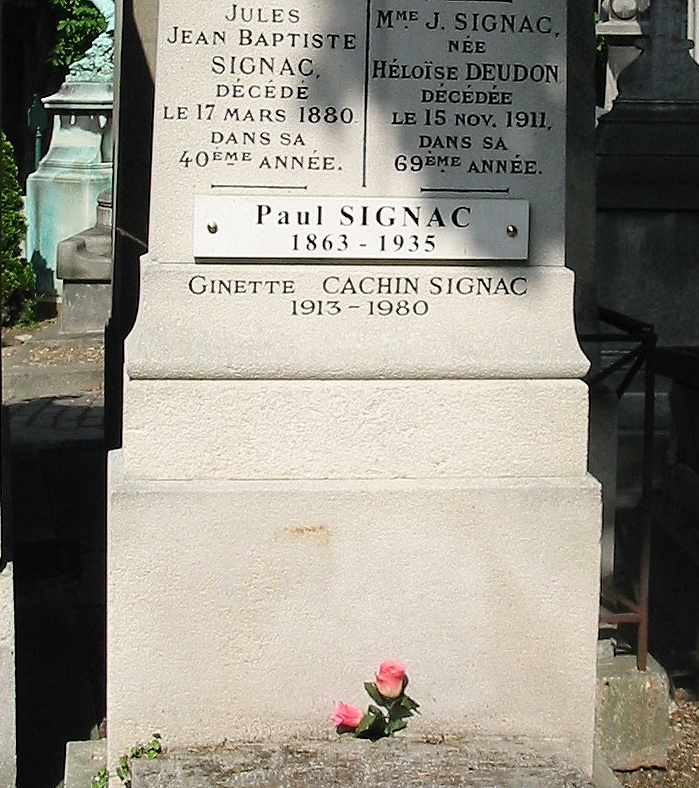 Strindberg was a figurative giant in Sweden, especially in Stockholm after he returned to his home city after many years abroad, mostly in Paris and Denmark. 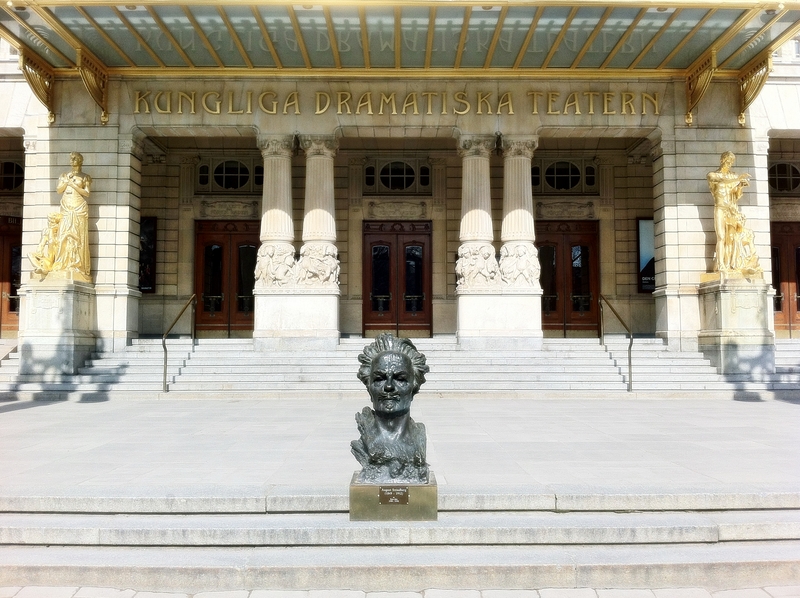 In 2012, on the 100th anniversary of his death, a bust of Strindberg was placed at the foot of the stairs leading to the entrance of the Royal Dramatic Theatre. I had been to the Strindberg Museum in Stockholm, a flat that was his last home. He called it the “Blue Tower”. I wrote about it here: From Orwell to Miller to Strindberg: A Journey Ending with Beethoven on a Wall. When I visited the museum discussed further above, where I first saw the etchings of Anders Zorn, I admired an etching-portrait of Strindberg. I liked it. Upon returning home I went to the Internet to see if I could find a digital image this portrait. I did, along with what appears to be all of Zorn’s work. I greedily downloaded much of what was there, including the Strindberg, storing it all in my private digital files. Why not print a copy of the Strindberg, I asked myself? So I did, and now it hangs on the wall so I can contemplate the fusion of two great artists. Between 1860 and 1870 a group of painters in France rebelled against the prevailing academic view of the art of painting. Free from rules and traditions, they wanted to render reality as they observed it on the spot: this entailed working quickly, because the sun could disappear behind the clouds at any moment. These ‘impressionists’ (from the French word impression) strove to depict light convincingly. They captured their impressions using an innovative painting technique with loose, short brushstrokes. Famous Impressionists are Edgar Degas, Claude Monet and Camille Pissaro. In the Netherlands, their manner of working influenced the painters of the Hague School and Amsterdam School. I have admired the Pointillism style since I learned of it more than 50 years ago when I was a student at Berkeley. This was when Patricia and I received a small settlement for an auto accident injury she suffered, enough for the minimum down-payment for a house in North Berkeley, one with an “in-law” apartment which we rented out. With the income from this rental, from our part-time jobs, and my G.I. Bill, we could finally afford to spread out and, coincidentally, have more room to accommodate our pending first child, Andrea, who appeared just as I was taking final exams for my BS in 1963. Despite our modest means, we had to have something beautiful to grace our living room. We chose a print of Paul Signac’s Santa Maria della Salute, 1904, executed in pointillist style. I loved that picture, even yearn for it still. It was lost to me through many moves, divorce, and the usual exigencies of life. Back to the Rijksmuseum. After touring the museum to our satisfaction, we naturally ended up in the store near the portal to the ordinary world. I didn’t have anything in mind to buy, but my eye was caught by a print of a painting in the pointillist style, “Portrait of Marie Jeanette de Lange”, by Jan Toorop. It now is the centerpiece for the hangings on the avocado-colored wall. It is beautiful and pleasing in itself, but it also reminds me of my lost Signac. 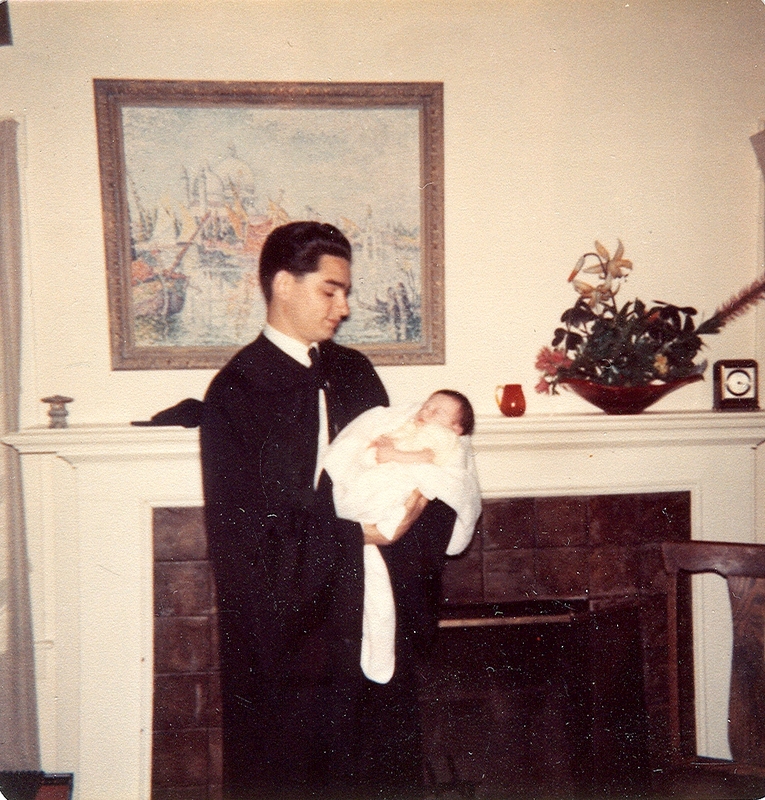 Ron Pavellas in his BS graduation robes, with newborn daughter Andrea, May 1963. The print on the wall is of the painting Santa Maria della Salute, 1904, by Paul Signac. This entry was posted in Essays, Memoirs and tagged "Portrait of Marie Jeanette de Lange”, Alaska, Alexander K. Pavellas, Anders Zorn, August Saint-Gaudens, August Strindberg, Baranoff Island, Berkeley, California, Dee Longenbaugh, G. Sieverding, George Demetrious Papagegeorge-palladius, Harriette Eugenia Anderson, Heinrich Rottman., Jan Toorop, Jim Lucas, Juneau, Mary Genevieve Harpending Papageorge, Nestor Harpending Palladius, Niccolò Paganini, Paris, Paul Signac, Père Lachaise Cemetery, Pointillism, Regina Andersson, Rijksmuseum, San Francisco Greek Historical Society, Santa Maria della Salute 1904, Sitka, Stockholm, The Holy Trinity Icon, WQXR. Bookmark the permalink. I am so drawn to all of these beautiful things that you describe that it confounds me. It makes me wonder whether I am drawing on memories that are not my own or that somehow I am on a different wavelength than what I know of my own family. I suppose that is a handy feature of being the product of my own destructive family experiences, to be drawn to that which is not familiar in all senses of the word. Synchronistically, many of these things you describe are uniquely familiar to me in contrast with my family. Lately, I’ve been thinking about visiting some of the various Orthodox churches in my neighborhood while at the same time a bit nervous as to what sort of reception I might receive. I have visited churches and temples around the world of every possible description except for these. I enormously regret never having visited Greece, any of the Scandinavian countries, or any of Eastern Europe. I am lucky however to have explored Amsterdam, New York, San Francisco, Berkeley, and Italy, among many other places. My last home under my name in the U.S. was in the Berkeley Hills. The memory is bittersweet. I am struck that I was recently at Grand Central Station, a place I’ve loved for many years, just in August. I stepped out into the bright sunshine to witness a policeman’s funeral and then partook of the fine offerings at a Nat Sherman store. My love of the Dutch Masters and Amsterdam is stimulated by your prose. My relationship with classical music is complex but the Italians, Austrians, and Russians also resonated with me far more than the music of my childhood which I associate with pain and suffering, so I don’t name it, because, I don’t want to stop the music that others enjoy so much. I played the violin, piano, and pump organ, and so these items were sold and not because money was an issue. Now all I have is my voice which I shaped to my own liking rather than theirs. I love to paint other people’s walls. That is something that my mother taught me that stuck. However, for my own home, I prefer minimal decoration. I’m going to come back and read this again. It is so rich that I will need to dedicate more time to get lost into it. How wonderful for you to have such rich memories. Thank you so much for publishing them.